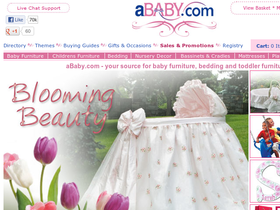 ABaby, online at aBaby.com, is your destination for baby furniture and accessories. ABaby has a large selection of baby cribs, bassinets, children's beds, lamps, and nursing pillows. There are also plenty of clothes stands, growth charts, cradles, stroller accessories, and potty chairs to choose from at aBaby. Cloth diapers, pacifier clips, baby jewelry, car seats, and diaper bags are also available at aBaby. Find out about the latest sales, weekly specials, and deals of the day at aBaby. RetailSteal.com has the best aBaby, promos, aBaby coupon codes, aBaby, coupons, and aBaby discounts. Shipping and handling rates at aBaby depend on the pricing of your order and your shipping destination. An upgraded shipping method may be requested with extra charge. Orders are shipped in the Continental US as well as to international destinations. See website for full details, exclusions may apply. Act now and enjoy a $10 discount on your order when you use this coupon code at checkout from aBaby.com. Orders of $100+ will qualify. Shop at aBaby.com and enjoy $100 savings on Theme Beds. Click here for code. Shop online at aBaby.com and enjoy a 25% discount on your crib purchase. Use this coupon code on crib orders of $1000 or more to qualify. Use this coupon code on aBaby.com to save 10% on your purchase for a limited time only. Offer valid on orders of $100 or more. Shop at aBaby.com and enjoy 10% savings on Outdoor items. Click here for code. Enjoy free shipping on most items from aBaby.com. Visit the clearance section of aBaby.com and save up to 60% on merchandise. Save up to 20% on the Deal of the Day at aBaby.com. Click link to save. Save $10 on high chairs when you use our coupon code to shop online at aBaby.com today.